The Gold Prospecting Lessons Survey Results gave us a clear idea what training YOU want and the things you want to know about to shorten and simplify your learning time for finding gold. Here is a graphical representation ofthe results and it clearly shows the subjects you want to learn about and how and where you want the training delivered to you. The Question was "IF 'Other' Selected - What type of training or Locality Would Assist You"
Places close to Perth for practising and simulating a ground were you can find gold in the Perth city region. I would love to have field practice however I live in Queensland. I will be travelling to wa next winter and would like to know when the seminars are happening. A seminar (preferably in Perth) on how to read different ground compositions with detailed colour photos of different gold bearing ground compositions; later on a field trip to give hands on experience. They are representative of many other suggestions in the survey. 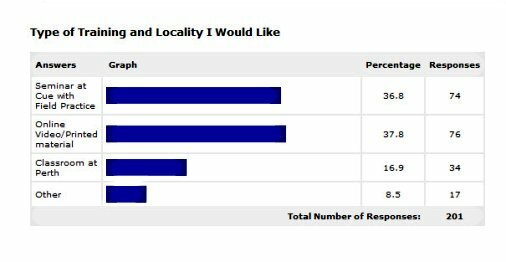 ... but "Access and Using Tengraph" (15.5%) and "Downloading and Using Geomap" (15.1%) also rated very highly as subjects that people want to learn about. Basic and advanced Metal Detecting techniques (12.6%) and Use of Minelab Detectors (14%) also rated highly. The Question was "If you Selected "Other" What Other Training Subjects Would You Like?" An explanation and recognition of the various rocks etc that relate to gold. Hands On - going out to various sites and actually prospecting. Learning about the geology of the land, what to look for eg: Shear Zones, quartz all the things that gold seems to be around. Identifying geological formations that are always associated with alluvial gold finds. Training in loaming to find deposits, alluvial flows, plus how to assay; work small deposits by hand. We are going to provide training based around the key things you are interested in at the beginning of the next Gold Prospecting season. We will be emailing those people who completed the survey form directly to their email address about dates, venues and subjects that we will cover. Make sure you subscribe to our eGold Monthly Newsletter so you know when the training starts and book if you are interested. 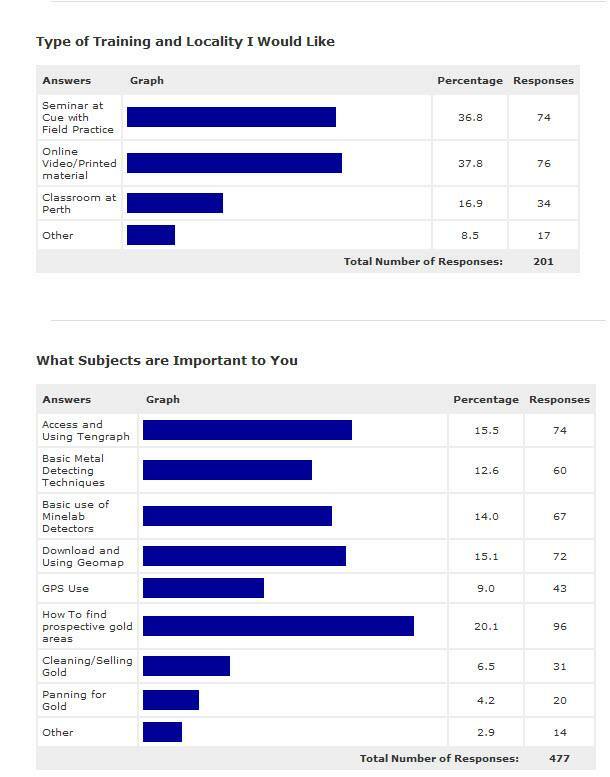 Return to Gold Prospecting Lessons Page from Gold Prospecting Lessons Survey Results page.